It’s a lovely Sunday afternoon and I have a freshly baked apple pie cooling in the kitchen, so I thought I’d pull out the book Apples by Roger Yepsen for a quick review. I found this book at a used book store last year and bought it, I confess, for purely aesthetic reasons. It’s one of those small, beautifully illustrated books that makes for a great gift or coffee table garnish. I was pleasantly surprised to discover that it is a rather informative book as well. Yepsen gives an overview of the history of the apple, discussing the disturbing lack of variety found in most grocery stores and the recent emergence of what he calls an “apple revival”: the growing interest in the United States and Great Britain in buying locally grown apples and rescuing near-extinct apple varieties. He gives tips on apple buying, growing and cooking, and then follows it all up with the best part of the book: descriptions and illustrations of ninety-two different kinds of apples. I am fortunate enough to live near a fantastic farmer’s market, and the variety of produce found there is pretty impressive. In the last couple of years I’ve become more adventurous in my apple-buying, motivated in part by Yepsen’s book. 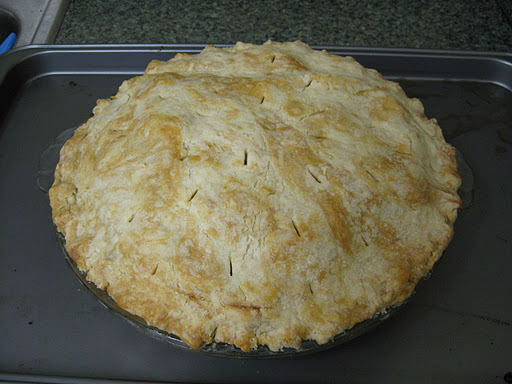 When I bought apples yesterday for my pie I picked out one or two of everything there: Stayman, Golden Delicious, York, Empire, Honey Crisp, Granny Smith, Fuji, and Gala. Gala has been my favorite apple for years, but last year I branched out a little when I discovered that Golden Delicious are, in fact, delicious. I know that sounds dumb, but I had always assumed that Golden Delicious taste like Red Delicious, which I don’t like, so I stayed away from them for years. Staymans are a great apple, too. They’re a little tart, but very crisp and keep well. I’m not a fan of Granny Smiths (too sour!) but it’s good to throw one of them into a pie to add a little variety. I had forgotten what I thought of Fuji, York, Empire and Honey Crisp, so I, naturally, had to test taste them as I prepared the pie. Fuji and Honey Crisp are okay, although I probably won’t buy them again. I remembered as soon as I bit into it that I do not like York apples; they taste too much like apple juice. * But Empires! I think they just became my new favorite munching apple (sorry, Gala). They’re amazing. I better stop before I drool all over the keyboard. The smell of the pie isn’t helping any, either. And I don’t get to eat any until tomorrow! Argh! The torture! Any other apple fans out there? What are your favorites? Stop torturing me, pie . . .
* I love everything apple – pie, cider, fritters, sauce, etc. – but I can’t stand apple juice. I have no idea why. Every time I triedmentally composing this review I realized I was writing it as though you werealready familiar with Anne Fadiman’s essays. Why wouldn’t you be? Surely everyreader out there knows and loves Ex Libris! Even though I’ve reminded myself numeroustimes that just because I have pulled that little book off theshelf many, many times does not mean that everyone else has, too, I continually fell back into (mentally) chattingabout Anne Fadiman’s AtLarge and At Small as thoughshe is a mutual friend. Perhaps this stemsfrom Fadiman’s writing style. She is awitty and knowledgeable writer, and reading her essays reminds me of my favorite courses when I was a student. These were the courses where the discussion flowed easily, filled withinsightful, yet personal, comments peppered with just the right amount ofhumor. Classes like those were myfavorite part of being a student, which is probably why I love Fadiman somuch. Her writing is a blending of thepersonal and the critical, and the end result warms my little nerdy heart to noend. This genre, Fadimanlaments, is fading away. At Large and At Small is her “contribution to the war effort”in the battle to save the familiar essay, and I hope many more contributionsfollow. It is certainly a genre worthsaving. 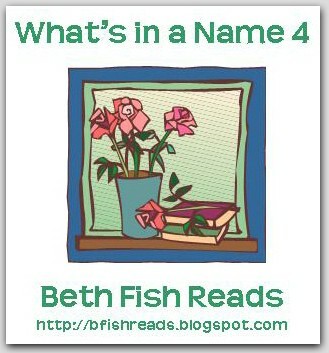 P. S. After readingthis I discovered that it fits the “size” category for the What’s in a Name? Challenge. Hurray for me! One book down, five to go. I read this book for the first time in high school. When I left for college I “borrowed” my dad’s copy, and since then it has moved with me, from dorm room to dorm room, from house to house, from one side of the country to the next. Once it resided on a measly book shelf assembled out of bricks and a few warped boards; now it lives on a proper bookshelf in a house just a few short blocks from a small, meandering East coast river. So how do I review this book? 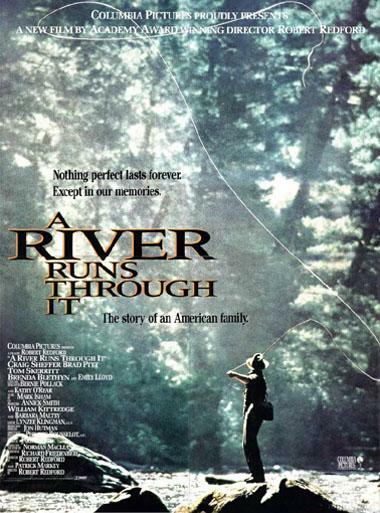 It’s one of those books that has so permeated my being that just looking at it conjures up images of the Big Blackfoot River, and I can hear the river rushing past me even though I’ve never actually stood on its banks. Passages from the story are etched in my brain; I am as haunted by waters as I am that book. If I moved today, and for some reason could only take with me one book, that would be the one I would take. It is the piece of the West I carry with me no matter where I live, so that even when I do not have mountains, big skies and wild rivers, I at least have the words. “My mother turned and went to her bedroom where, in a house full of men and rods and rifles, she had faced most of her great problems alone. She never was to ask me a question about the man she loved most and understood least. Perhaps she knew enough to know that for her it was enough to have loved him. He was probably the only man in the world who had held her in his arms and leaned back and laughed” (111). “It is those we live with and love and should know who elude us” (113). “Of course, now I am too old to be much of a fisherman, and now of course I usually fish the big waters alone, although some friends think I shouldn’t. Like many fly fisherman in western Montana where the summer days are almost Arctic in length, I often do not start fishing until the cool of the evening. Then in the Arctic half-light of the canyon, all existence fades to a being with my soul and memories and the sounds of the Big Blackfoot River and a four-count rhythm and the hope that a fish will rise. “I am haunted by waters” (113). Has That Woman Gone Insane??? So my latest insane book moment (explanation here) was a bit more out there than my usual insane moments. (Wait, what? A “usual” insane moment? Never mind. I’m not even going to try to figure that out. It’s making my brain hurt.) My fits of hysterical giggles came while reading . . . a vegan cookie cookbook. Yes, you read that correctly. 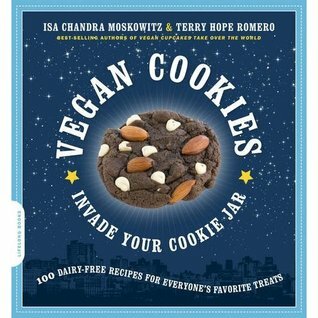 Vegan cookie cookbook. I’m not vegan, by the way. I also don’t usually sit down and read cookbooks cover to cover, either. In fact, I could count on one hand the number of times I’ve done that (twice). So . . . why? You can use evaporated cane juice whenever we call for sugar. It acts exactly the same in recipes, but it is processed a bit less and retains some of its vitamins. Because when you’re eating cookies what you’re really thinking about is vitamins (10). P.S. I didn’t just read the book, I actually made a few of the cookies, too. I made the Peanut Butter Blondies, Citrus Glitters and Mexican Chocolate Snickerdoodles. All were delicious, although I had to tone down the cheyenne in the Mexican Chocolate Snickerdoodles. When I made that first batch – yow! I thought my mouth was going to catch on fire! So I mailed them to my brother, muhahahahaha. Oddly enough, he never called to thank me . . .